I had the opportunity to test out a vintage 285 Frequency Shifter. 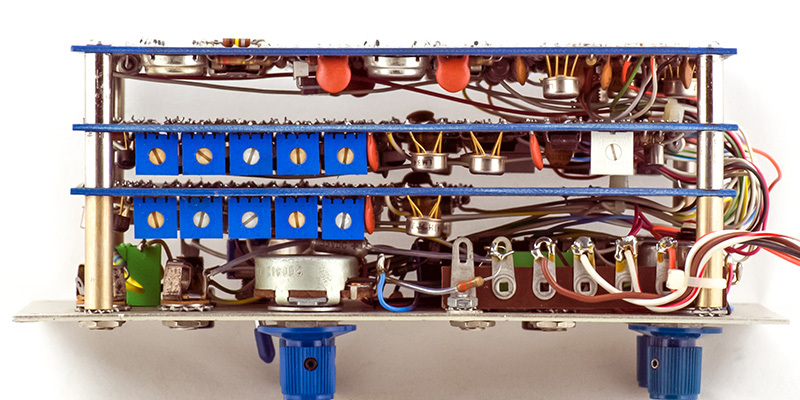 The construction is a three PCB-stack with the front panel controls hand wired to terminal strips. The middle two PCBs are the same and one is half-stuffed. The PCB is the reference oscillator and the 90 degree phase filters. The half-stuffed PCB is the 90 degree phase filter for the Signal input. The trimmers for the phase filters are on the right side of the module. 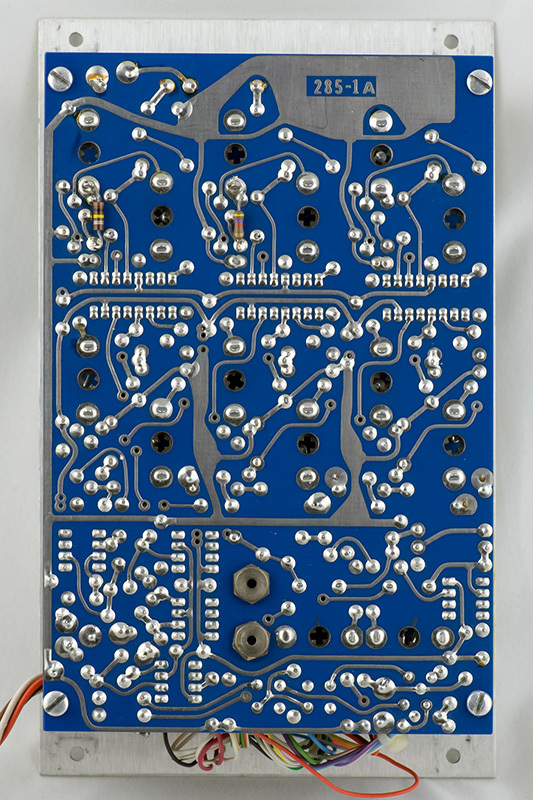 The full-stuffed PCB also has the sine shape trimmer. The rear of the PCB are the trimmers for the multipliers. There are a lot of trimmers on this module but calibration is pretty straightforward. Calibration is not difficult but does require a two channel oscilloscope. You need to access some signals on the inner boards so I found it easiest to separate the boards to access the signals. These adjustments are all on the full-stuffed filter board. Connect your scope to R71 closest to VIO. Set the Reference control to some reasonable frequency (100 - 500Hz) and adjust R89 for a nicely shaped sine. The top image is the reference oscillator core triangle and the bottom is the calibrated sine. 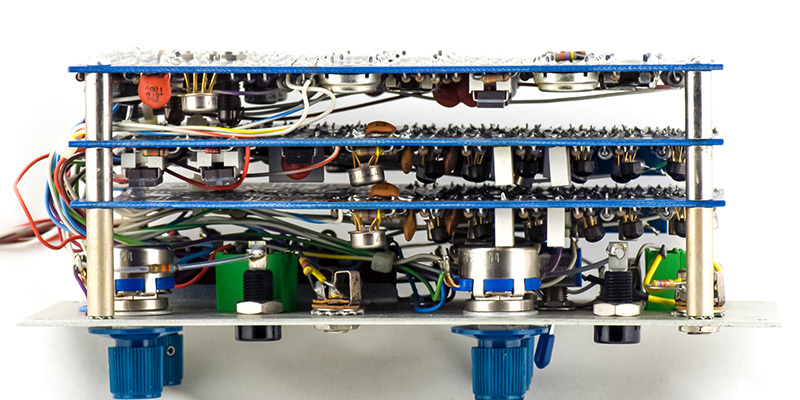 R+ was chosen at the factory for best symmetry of the local oscillator at low frequencies. Adjust if necessary. 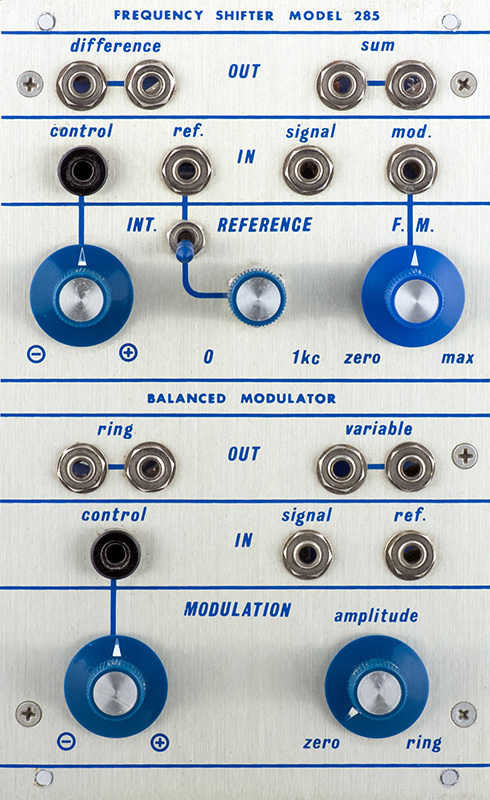 R* was chosen at the factory to set the lowest frequency of the local oscillator. Adjust if necessary. There are two sets of filters that need to be calibrated. Plug an external sine oscillator into Signal with a +/2V amplitude. Set Reference to Ext (up). Connect a dual channel scope probe 1 to the + side of C8 on the rear PCB. Connect probe 2 to the + side of C14. Make these adjustments on the half-stuffed board. 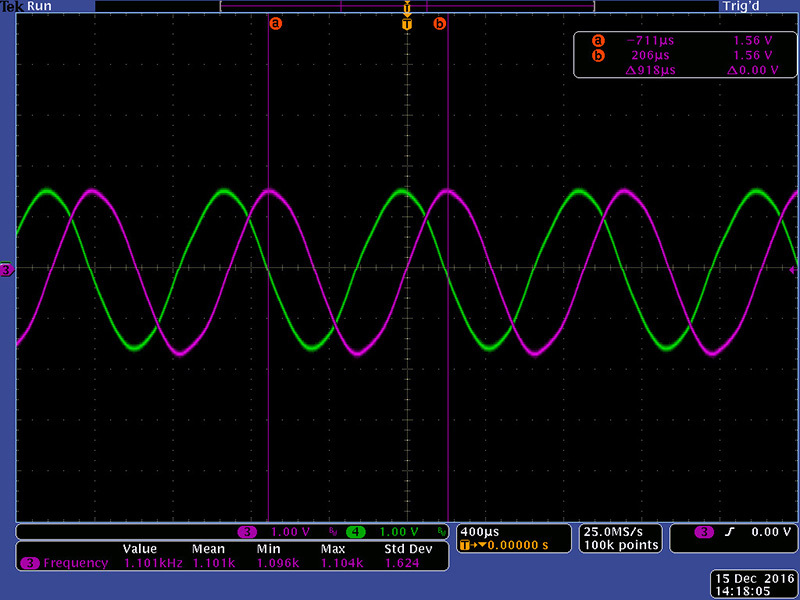 Set the external oscillator to 11 KHz and adjust R55 for a 90 degree phase shift between the two sine waves. Set the external oscillator to 1100 Hz and adjust R50 for a 90 degree phase shift between the two sine waves. This image shows the two waveforms. 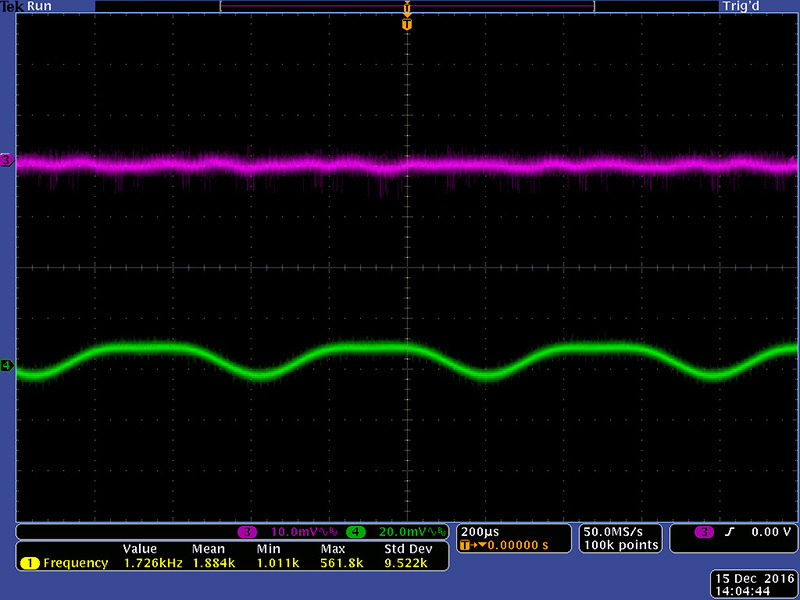 I used the cursor as a visual aid to adjust the green waveform zero crossing to the magenta waveform peak. Set the external oscillator to 110 Hz and adjust R45 for a 90 degree phase shift between the two sine waves. Set the external oscillator to 11 Hz and adjust R40 for a 90 degree phase shift between the two sine waves. 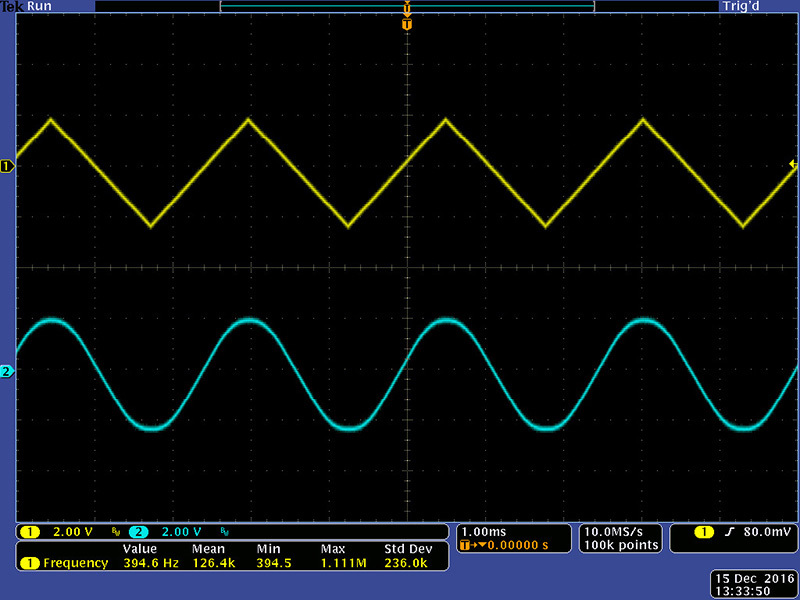 Set the external oscillator to 1.1 Hz and adjust R35 for a 90 degree phase shift between the two sine waves. Plug the external sine oscillator into Ref. Connect probe 1 to the + side of C8 on the rear PCB. Connect probe 2 to the + side of C14. Make these adjustments on the full-stuffed board. 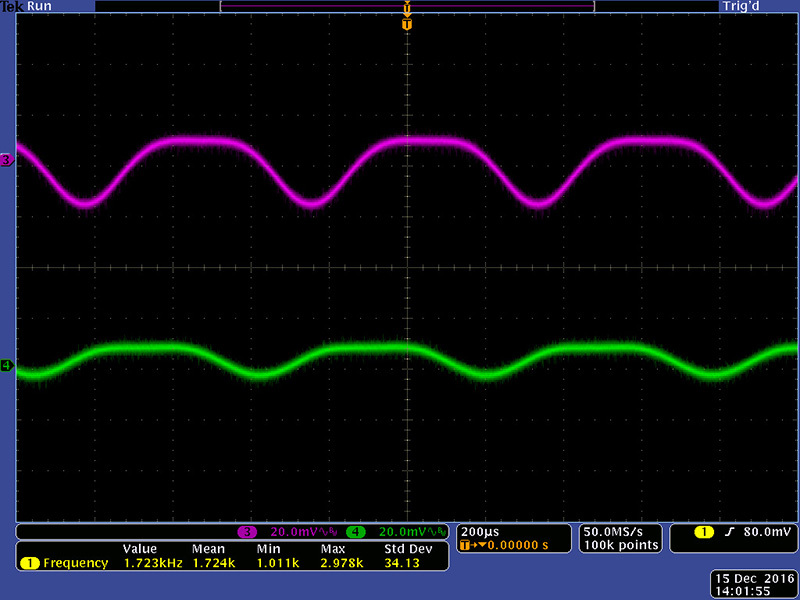 Set the external oscillator to 1100 Hz and adjust R50 for a 90 degree phase shift between the two sine waves. Make these adjustments on the rear PCB. 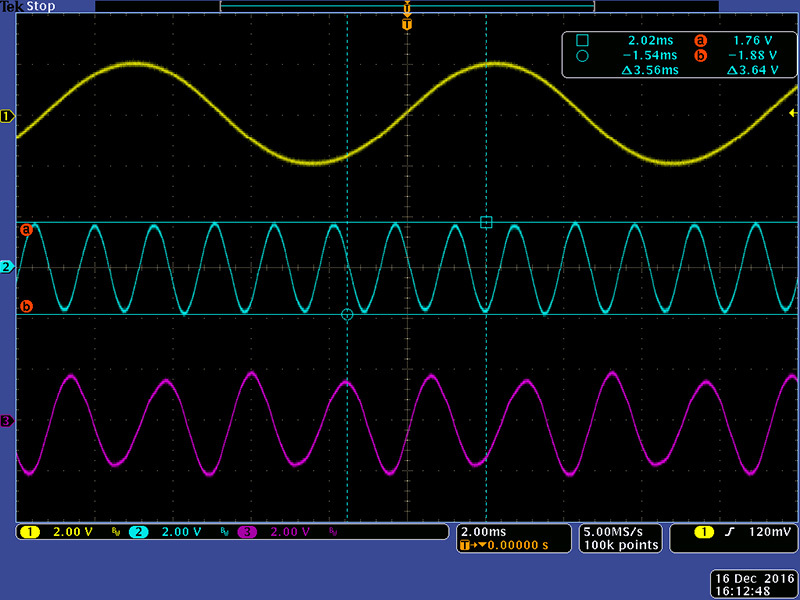 Plug an external sine oscillator into Signal with a +/2V amplitude. Set Reference to Ext (up). Connect a dual channel scope probe 1 to TP1 and probe 2 to TP2. 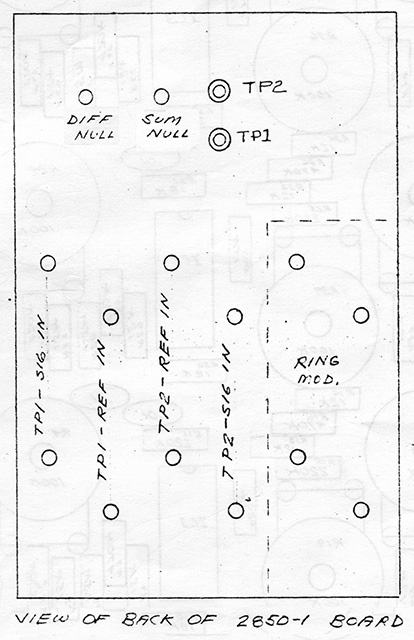 Set these channels to AC coupled and a low setting in the 10mv - 50mV range. Adjust R19 for a minimum waveform on TP1. Once this is set to minimum, then adjust R6 to further minimize it. This scope image shows the initial waveforms on TP1 and TP2. This scope image shows the result of minimizing TP1 with R19. This scope image shows the result of minimizing TP1 with R6. Note I have increased the sensitivity from 20mV to 10mV. Adjust R38 for a minimum waveform on TP2. Once this is set to minimum, then adjust R24 to further minimize it. Remove the external sine oscillator and plug it into Ref. Adjust R18 for a minimum waveform on TP1. Once this is set to minimum, then adjust R4 to further minimize it. Adjust R39 for a minimum waveform on TP2. Once this is set to minimum, then adjust R26 to further minimize it. The Sum Null R43 and the Diff Null R44 set the balance between the two multipliers. They have very minor adjustments so you can always just center them. Make these adjustments on the rear PCB. 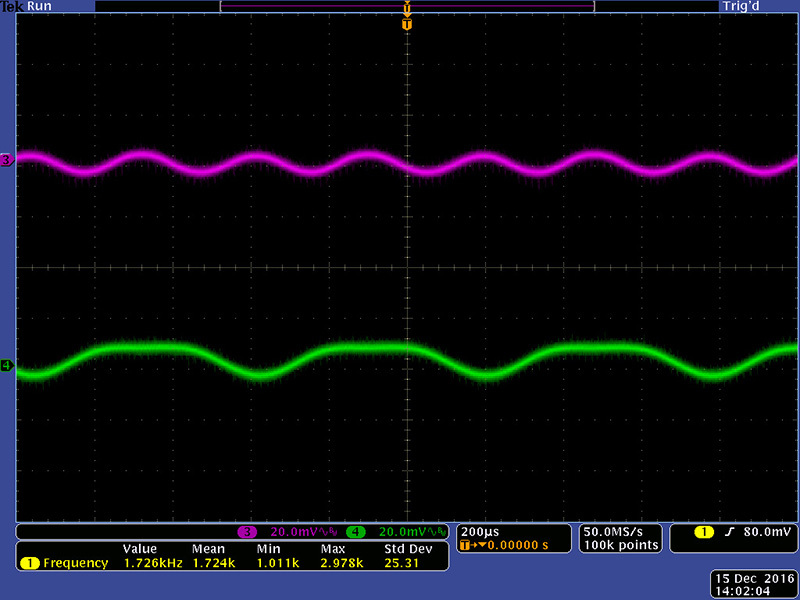 Plug an external sine oscillator into Signal with a +/2V amplitude and set Reference to Int. Adjust the display until you get a stable Sum (cyan) and Difference (magenta) output. I used my cursors to highlight the peaks differ in amplitude. Adjust the Sum Null R43 first until you get the peaks of the Sum Out even. Adjust the Diff Null R44 second until you get the peaks of the Difference Out even. There is some interaction in the trimmers so you may have to go back and iterate to get them even. 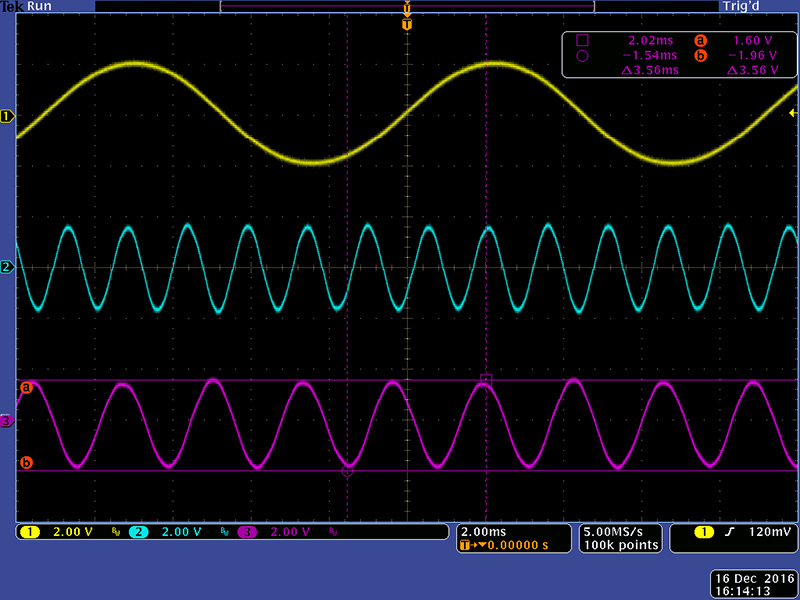 Plug an external sine oscillator into Signal with a +/2V amplitude. Connect a scope probe to Ring Out. Set the channel to AC coupled and a low setting in the 10mv - 50mV range. Make these adjustments on the rear PCB. Adjust R76 for a minimum waveform. Once this is set to minimum, then adjust R63 to further minimize it. Adjust R75 for a minimum waveform. Once this is set to minimum, then adjust R61 to further minimize it.